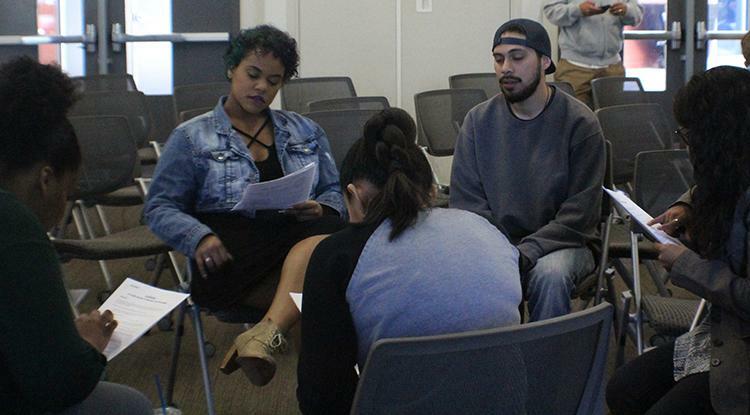 American River College hosted a brave space meeting Thursday, organized by the members of UNITE. The event primarily focused on the importance of representation for people of color in the media and the presence of racism in film and television. “It is evident that there is no ‘voice of color’ in this movie, ‘white rich people make movies with faces of color with no black voice.’” said Spencer. Spencer began focusing on the flaws in the movie. “It feels very wrong knowing that this movie was created by white people, because we need to hear the black and Latina voice, for example,” said Spencer. The purpose of showing the clips was to introduce the difference between systematic racism and internalized racism. Valencia Scott, a UNITE community intern, explained the difference between the two types of racism, since they are often misused. A total of three clips were shown, and in between each clip the students formed groups to share their opinions and personal experiences about racism and lack of representation. “It’s important to analyze and deconstruct television shows and movies and hold people accountable for lack of representation,” said Scott. The meeting also tackled the idea that many people, especially young people, believe that racism no longer exists. “People fallaciously believe that racial problems have been resolved because overt racism is no longer politically correct, but this not true,” said Spencer. “America embodies a racist-like mentality without knowing it, it’s a misconception that if we stop talking about racism it’ll go away. We have to continually bring it up to make people aware of it,” said Scott. A lot of the time, people assume that the media’s representation “accurately depicts that entire group, and that isn’t true,” said Scott. Ashley Holly, a black ARC student, voiced her opinion on the way blacks are treated in America. “When people see a black person in power, like Obama and they automatically assume that racism is over. We’re not allowed to talk about race without being sensitive because racism is ‘over.’” said Holly. Holly then begins to describe how she handles the unfair treatment people of color might face in America. Scott closed the meeting by touching back on the movie and asking the audience for their final thoughts. In Crash, a woman of color is physically violated by a white police officer. “Cops are the people who are in power and when one of them sexualizes you it’s very traumatic,” said Spencer. UNITE plans to hold more brave space meetings based on topics that students have picked from. Be the first to comment on "Brave space tackles representation and racism in the media"